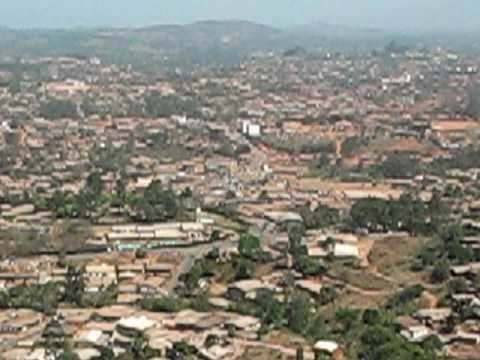 Bamenda, also known as Abakwa and Mankon Town, is a city in northwestern Cameroon and capital of the Northwest Region. The city had a population of about 500,000 people, and is located 366 kilometres (227 mi) north-west of the Cameroonian capital, Yaoundé. Bamenda is known for its cool climate and scenic hilly location. Bamenda's principal ethnic group is the Tikar. In the past, the Tikar faced invasions from peoples in the surrounding hills, and between 1700 and 1800, they joined a confederation established by the Mbum for defense purposes. However, Bamenda also encompasses the Nguemba people. Bamenda was subjected to German colonialism in the late 19th century, and evidence of Germany's former occupation of Bamenda can still be seen today in structures such as the Fort at the Bamenda station; (the present day fort is used as the Bamenda High Court, the Court of first instance and the office of the Senior Divisional officers) the nearby Bafut Palace. After the defeat of the Germans in World War I (1914–1918) the League of Nations shared German colonial territories among victorious nations. Western Cameroon (the present day North West and South West Regions) were administered jointly with Nigeria under the protectorate of the British until 1961 when following a plebiscite it attained independence by joining the then already independent République du Cameroun. Today, many of the city's inhabitants are English-speaking, and Cameroonian Pidgin English is the main language spoken in the shops and on the streets of Bamenda. Some anglophone political pressure groups represented in the city such as the Southern Cameroons National Council (SCNC) advocate secession from the rest of Cameroon, which is francophone. As a regional centre, the city has numerous markets, banks, and offices. The main industries are the processing of agricultural produce such as coffee, elementary food processing, handicraft, cottage industry, education (schools), tourism/hospitality, construction works and transport. The local museum and shops display a wide variety of local baskets, beads, woodcarvings and bronze statues. In Bamenda there are cultural sites such as the Mankon Fon's Palace with its newly constructed museum, and the Bali Fon's palace with its ancient architectural structures. The mountainous terrain around the city affords scenic views such as that from the mountain Sabga over the Ndop plain. 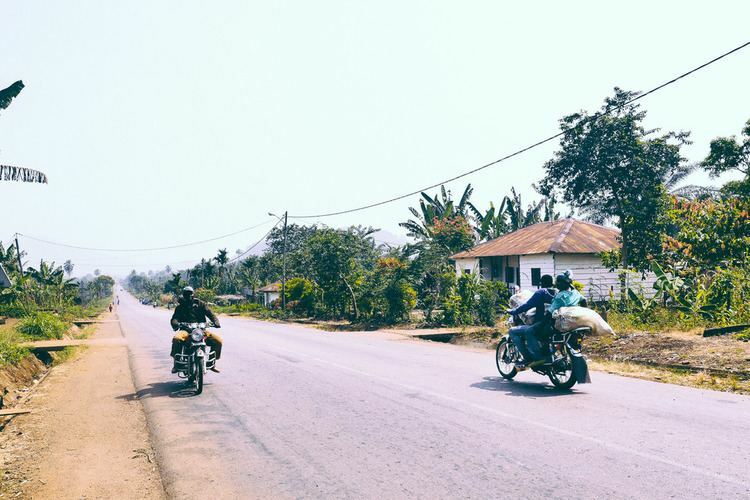 The city of Bamenda has road links to Yaoundé and Douala, as well as a disused airport located in bafut subdivision. North of the city is the Bamenda Ring Road, a 367 kilometres (228 mi) circular route through some of Cameroon's most spectacular mountains. Along this road is Mount Oku 3,000 metres (9,800 ft), the Kimbi River Game Reserve, the Menchum River waterfalls, a huge chief's palace at Bafut, and a pyramidal thatched shrine at Akum (also known as Bagangu). The Bamenda area is placed under the supervision of a government delegate to the City Council who is appointed by the head of state. He is appointed by presidential decree and presently is Ndumu Nji Vincent who served formerly as Technical Adviser to the Prime Minister. The city of Bamenda also has a small village called Mbatu. In Mbatu, there is a historical large stone on a hill which is shaped like a human face with one eye. This stone is called "Ngoh-ngwabah" which means a stone on a hill. Beneath the stone is a small habitat for Monkeys and Hares. According to the World Health Organization, Bamenda is the most polluted city in Africa in terms of PM2.5 particulate matter. The Bamenda University of Science and Technology (BUST) is a brain child of The Industrial and Educational Development Company Ltd (INDECO). It was incorporated on the 12th October 1995. INDECO and the university were founded by the Late Rt. Hon. Dr. John Ngu Foncha, with the encouragement of the Cameroon Government. The university went operational in January 1998. At the request of government, BUST participated and contributed extensively to the drafting of the Law on Private Higher Education in Cameroon. BUST is a 4-year Arts, Science and Technology University and went operational in 1998. Degrees offered include B.A., B.Ed., B.Sc., HND.,SRN., AN., Lab. Tech., and Assist. Lab. Tech. Formalities for Post Graduate Studies have been put in place, to go operational by the academic year 2010/2011. Its main national affiliate is the University of Buéa, though other partnership arrangements are under way with the University of Dschang. The Bamenda University of Science and Technology is affiliated to the University of Osnabrück (Germany) and the University of Wales at Bangor. There is also the University of Bamenda located in Bambili Town, founded in 2010. It trains college teachers, medical doctors etc. and graduates in Accountancy, management, marketing, and a number of other fields of study. Another institution of higher learning is National Polytechnic Bamenda, formerly National Polytechnic Bambui. Over the years, Bamenda has had two football teams that played in the First Division Championship. In the 1970s, it was PWD Bamenda and later in the 1980s, it was Camark Bamenda. With the fall in the influence and budgeting of public works department and National Produce Marketing Board (NPMB), both teams fell from the limelight. Presently Camark Bamenda is out of existence, while PWD Bamenda plays in the third tier of the Cameroon professional league. The only club in the professional league at the moment is Yong Sports Academy. They are the current winners of the Cameroon cup (2013). Bamenda is the founding place and seat of the largest opposition political party in Cameroon, the Social Democratic Front (SDF), and the home of its leader, John bin Fru Ndi. There is a large military presence throughout the city. On May 26, 1990, a group of Bamenda elites launched the party in Ntarikon Bamenda, despite a heavy police presence. However, the launching did not end without casualty. Six civilians were killed. Bamenda is also the birthplace of The Southern Cameroons National Council (SCNC), a group that has been asking for the restoration of the former British Southern Cameroons, a territory that covers the English-speaking provinces of North West and South West. The SCNC was born in Bamenda in 1994, after the All Anglophone Conference (AAC2) issued the Bamenda Declaration in which it had asked the government of President Paul Biya to respond to all anglophone grievances stated in the Buea Declaration of 1993, or face the wrath of the people of the Southern Cameroons. The Cameroon government failed to respond to the Bamenda Declaration and since then, the SCNC has categorically maintained that it now considers the restoration of the independence of the Southern Cameroons to be final and irrevocable.